The PlayStation 4 and Xbox One have garnered a lot of success with the Twitch online streaming services, leaving Nintendo once again as the odd man out. Streaming your gameplay from the Wii U on Twitch services is still a prospect some are looking forward to but still might have to wait a while to do. Polygon pressed Nintendo President Reggie Fils-Aime in an interview about Nintendo's take on the Twitch service and whether or not it will be coming to the Wii U. Fils-Aime's response seems to run contrary to the amount of time spent watching online videos. Fils-Aime stressed that Nintendo has a great relationship with Twitch and has interesting plans with them in the future, but streaming game footage needs to be more focused and not drag on for extended lengths of time. 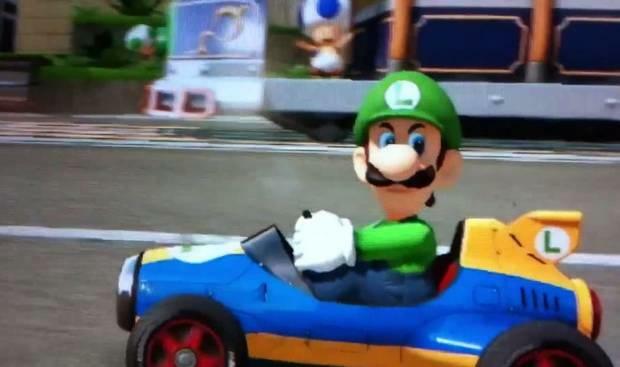 Reggie offers up Mario Kart TV as an example of Nintendo's view on streaming gameplay, mostly in response to the wide-spread positive reaction to Luigi's death stare. "Kart is fun because its a highlight of the race. You can make some choices as to what parts are going to be shared. We think that makes it interesting, and obviously the meme of the Luigi death stare is wonderful when that comes out of that type of experience. But in the end we've got to make sure that it's fun." I can agree with what Reggie is saying here. I am not really into watching streaming or Let's Plays, but those that I do check out all have a specific goal in mind. Breaking the game through bugs and glitches, setting up scenarios within specific games to see what happens, breaking a world record, or catching a brief amazing moment that some gamer was able to capture, Luigi's Death Stare or outlandish Grand Theft Auto V jumps for example. All are very focused examples. Sitting and just watching someone else play a game just distracts me from playing games on my own. On the other hand, ignoring the popularity Twitch gameplay streaming seems like the wrong way to go about it. The overwhelmingly positive response that PlayStation 4 and Xbox One owners are giving Twitch should be something Nintendo fans get to decide is fun or not. Denying it to them and telling them they aren't missing out doesn't sound like the best customer relations strategy, but its a strategy I would expect from Nintendo. Nintendo has always been very controlling of its properties, especially when it comes to video services like YouTube. It jumps in the way of fighting tournaments streaming Super Smash Bros. and put a stop to plenty of streaming channels focusing on it games. If streaming becomes a thing for Nintendo, you can bet it will be a service that the company has complete control over.